A journal of all the things I enjoy creating at home...inspired by my love for Disney. I was just looking back at my last post way back in August, and I once again realize how precious my blogging family is to me. It's been a surreal few months since I last posted, but the Goofin' Offs are back in business and ready to reconnect. Quick update on my projects for those that come here just for the cross stitching and quilting eye candy. I am looking forward to having more time this coming year to work on my projects. I really, really missed having a lack of time last year. Yay! We have a skull and crossbones. I'm afraid to say I didn't take pictures of my last quilt finish. I have begun being better about taking pictures again. So here are the fabrics I picked out for my current project. Sorry, there aren't any Disney fabrics in this one. All but one of the fabrics were graciously gifted to me by my mother-in-law. I spent some time during the holidays cutting out all of these pieces for the quilt center--all 624 of them. I'm not sure if this will be a record for me or not. I know many of you do centers with thousands of pieces, but I am just not there yet. It's not a competition, right? It's about the journey. Now for a quick update on the happenings of the Goofin' Offs. My last post found me spending time with my mother who had been diagnosed with terminal cancer. At that time, she had been given about another month and a half. Mr. Goofin' Off had a conference being held at the Disneyland Hotel, so of course I decided to join him. My mother insisted that I not miss the trip. She loved to travel and made it clear that no matter what happened, no one was to cancel a trip during her illness. While Mr. Goofin' Off was in classes the first morning, I headed off to check out the Pixar Fest goings on. 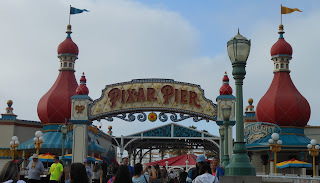 Here is the entrance to the newly themed Pixar Pier. It was really well done. I spent the morning there taking pictures and journaling. I found a nice quiet corner and enjoyed the Pixar music in the background and watching the families spending time playing together. It was a beautiful morning. Here is a video I put together with the pictures that I took that morning of the new Pixar Pier area. When I got back to the hotel later that morning, I received a call from my younger sister who was up staying with my parents for a long weekend to help my mom. My mom had taken a turn for the worse that morning. They were taking her up to the hospice center to see if they could stabilize her. From that moment on during the trip, things were pretty somber for us Goofin' Offs. I debated whether or not to fly back to Seattle to be with my parents and siblings, but whenever I talked to my mother on the phone she insisted I not come home early. Back at The Disneyland Hotel, I found this lone Bird of Paradise flower blooming. My mother loved this type of flower as it reminded her of some our happiest family vacations to Hawaii. In some odd way, it provided me comfort throughout the week. When we flew home at the end of the week, I went to visit my mother at the hospice center. She looked extremely weak but wanted to know what new things we had seen. When we came back the next day, she had lost consciousness. I am grateful I had that one last conversation with her in person. The next week was spent waiting with various family members in her hospital room at the hospice center. They moved her to a nice large room to accommodate our large family. It had a beautiful view of the the Puget Sound. My mom always liked a good upgrade, so we embraced this room change as her final upgrade. She passed away on August 18th. My father has Parkinson's and is legally blind. As you can imagine, we have been spending a lot of time helping with things around his house and making sure he gets dinner every day. He has finally agreed to get an apartment in an assisted living building. I am glad he came to this conclusion on his own. We have to wait for an opening which may take a few months. However, this gives us a chance to start helping him clean and prepare for the move. We are hoping his move will help take some of the pressure off of the family and help things get back to a normal state of being. So now you have all the updates. I am excited be back and am glad that things are getting back to a new "normal." I can't wait to re-engage with all of you. I can't believe how fast this year has been going by. I have so many things on my plate and am always missing my blogging friends. I know at some point things will calm down, but it will be bittersweet. As always, working on my quilting and cross stitching is my sanity saver. I'll give a few updates on my projects before I let you in on what's been going on with the Goofin' Offs. Back in May I started a new quilting project for Project Linus. Although it doesn't use any Disney fabrics, I have changed the original pattern to use up some blue scraps. I honestly thought I had taken more photos of this project, but I guess I was mistaken. It's assembled with black, white, and assorted blue scraps. To start with, here is a picture of all the black fabric cut out. Below are the first sub-units starting to be assembled. Notice the beautiful glass rose from Beauty and the Best in the background? My nephews gave it to me for Mother's Day this year. We just so happened to be at Disneyland at the time, so it has a lot of extra special meaning for me. I have been busy working my transcription job and starting work as a travel consultant. As I continue to find what I enjoy and don't enjoy about being a travel consultant, I think I may at some point change from a travel consultant to a travel planning blogger. I do finally have a website up and running. So far the most-visited page is the page where I keep a list of major sweepstakes that are free to enter and offer grand prizes of travel. You can find it here. After all, who wouldn't want to win a free vacation from likes of Disney or Coca Cola. In March the Goofin' Off family used our cruise credit from our cruise that was canceled last fall. It was a 7-day Caribbean cruise aboard the Oasis of the Seas ship. We enjoyed all the activities this ship has to offer. You can see Mr. Goofin' Off certainly took time to enjoy them all. We purposely chose a cruise leaving from Port Canaveral so that we could sneak in a few days at Disney World. We had a few days left on our annual passes and really wanted to show Goofin' Off Jr. the new Pandora area. It was a whirlwind few days. April came and went and was uneventful but extremely busy. I was working and putting together the basics of my website. I'm not sure on some things, but I'm definitely getting better at web design. May came with a trip to Disneyland. Mr. Goofin' Off, myself, and my two nephews went for a quick trip. For the record, my nephews are in their mid- to late-20's, so no little ones on this trip. We had a great time and indulged ourselves in a few dozen (yes, that really is dozen) Mickey Mouse beignets and a number of churros. It was actually a bit chilly for the time of year in Southern California. We didn't mind because it made waiting in lines much more bearable. May came and my dad had to have a hernia operation. My mother had been having stomach problems and the test results came back while my dad was still in the hospital. It was stage IV pancreatic cancer. She has chosen not to do chemo because of the side effects and the fact that it would only prolong her life a few months. June was a month of adjusting to a new normal. Mr. Goofin' Off and I go over to my parents' house every Tuesday for dinner time with them. We let my parents choose what they want to do. The first month, my mother wanted to go out to eat. At this point, we are bringing dinner over to them every Tuesday and just enjoying time with them. July started out with Mr. Goofin' Off coming down with pneumonia...just three days before he was to leave for India. His company has him helping set up a new office in India. The doctor put him on some strong antibiotics and gave him the clearance to travel, so he was off to India for a week. As you can imagine, I was really worried about him while he was gone. Luckily, he came home much healthier than he left. The end of June had lots of extended family come up and spend time with my parents. We had a great time catching up. I had two nephews stay with us during that time and really enjoyed having teenage boys around the house again. I have some pretty awesome family! August is here and so much going on. I try to attend at least one appointment every week with my mother's hospice workers. She is really slowing down and sleeping a lot. It's hard to leave my parents sometimes when it's time to go. Mr. Goofin' Off and I are headed out to a conference next week. It was all scheduled before we got the news of the cancer. I am grateful that I have a sister coming up from Salt Lake City for a few days followed by my brother coming up to help at the end of the week. I can rest a little more easily while I'll be gone. Enough of my ramblings. You are now caught up. Even though things are crazy busy at times, I am grateful for each and every moment of it. I'm looking forward to catching up with all my blogging friends. You all bring such a positive energy into my life. Well, it’s been months…four months to be exact since my last post. The time has just flown by. Thank you to those who have contacted me to see how things are going. I appreciate your care and concern. Everything has been just great the past four months in the Goofin’ Off household. There have been a lot of great things happening here, but I’ll get to that in a little further down in the post. I know a lot of you are just here for the project updates, so let’s get started there. I did manage to finish the quilt top for the Toy Story Woody quilt. It’s a happy little quilt. Now all I need to do get it all finished and sent off to the recipients. Mickey says it’s a happy little quilt. He is very pleased with how it turned out. Now all I need to do get it all finished and sent off to the recipients. I had hoped to get this done months ago...but...well, life gets in the ways sometimes. In my spare moments the past few months, it has been easiest to work on my cross stitch project, so this is where I have made the most progress. Mickey and Pirate Friends is coming along quite nicely. I didn’t always take pictures as I finished each section, but here are the latest sections I completed. I am excited because the corner of the pirate flag is beginning to show in the bottom right corner. In my last blog post, I had mentioned that I was excited about landing my dream job as a travel agent/travel consultant with a company that specialized in Disney travel. I was supposed to begin training the first part of November…then it was middle of November...but it was really the end of November before training began. It was a bit disappointing that training took so long to get started...one of many red flags I should have seen...but the bright side of that was a trip Mr. Goofin’ Off and I were able to take to Disney World in mid-November…at least I didn’t have to do training while I was in the happiest place on earth. Our visit to Disney World just happened to coincide with the transition of decorations into the holiday season. As you can see from a few of the pictures I took, when Disney does decorations, they do them big…quite literally. We had a great time and enjoyed the warm weather while it rained and poured back home in Seattle. A week after I got home, the training for the dream job began…but would it really be my job? The first week I became certified to sell Disney travel. I was in heaven. I was an official graduate of the “Disney College of Knowledge.” Certifications to sell vacations to Universal Studios (and the Wizarding World of Harry Potter) came next. Then certifications to sell Royal Caribbean Cruise Lines…all in all, I was spending 40 to 60 hours a week doing training and became certified to sell all of the major cruise lines, all-inclusive resorts, and tour companies. The paperwork I signed had indicated we (myself and the other three trainees) would be allowed to actually sell with the company about three weeks into the training. More than three months later, I was getting excuses from the back office as to why I wasn’t able to sell despite the fact that I had clients waiting to book and was OK to sell according to Disney and the cruise lines. They suggested I send my clients to one of their other travel agents. I asked if I would get to split the commission since I brought the client. Nope. I had enough, and they had breached our contract already several times, I had lost confidence in the company, so I said a goodbye to the them. This was mid-January. So what have I been doing the past month, you ask? I have been working on projects which gave me some time to think about what I wanted to do. It’s amazing how much I can focus and think things through when I am working on a project. Even though I hadn’t personally booked my clients, I went ahead and worked with them to book their trips on their own. I saved several of them from $500 to $800 from what they had been able to put together on their own. I was hooked. This is what I had always intended to do…provide people with the vacation they want at the best price I could find. So…after interviewing several new travel agencies, I signed on with a new one on Monday and should be able to start booking my clients within two business days. Yippee!!! 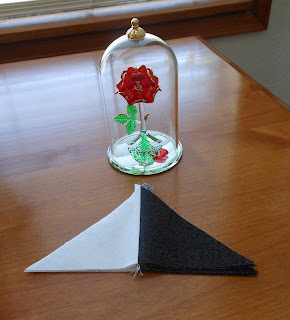 Rest assured, this blog will be all about my stitching, quilting, and love of Disney…not selling (although I will always be happy to help my blogging friends book their trips – fee free). Thanks for allowing me to ramble today and catch you up on what has been going on. 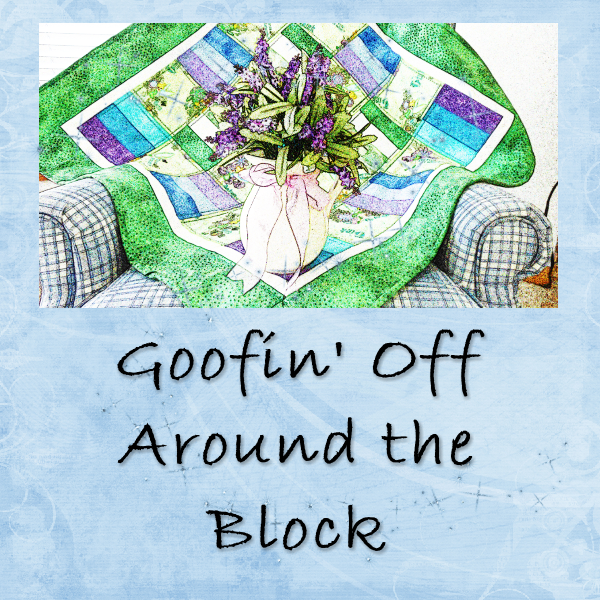 My life is returning to a semi-routine normal again, so I should have blog updates more often and hopefully will be able to join some stitch-a-longs and quilt-a-longs. I have missed you all more than you can know. Goofin' Off and Wondering Where Did October Go? I can't believe we're closing in on the end of October already. The Goofin' Offs have been having a great month and staying busy. It has definitely cut into my project time, but that's life I suppose. Thanks to all of those who wished me well on my last post about an exciting possibility for me. I have had several magical opportunities present themselves lately. But the one I am most excited about...well, I got a call and have made it to the next level of interview. I am keeping my fingers and toes crossed that it all goes well. I have not had as much time to sew lately, but I have managed to get the first two sets of borders on the Woody/Toy Story Quilt. The colors are coming together so well. It's such fun fabric to be working with. I love all the new Disney fabric lines that Camelot Fabrics has been coming out with lately...so many fabrics, so little time. I managed to get another section completed on the Mickey and Pirate friends cross stitch. 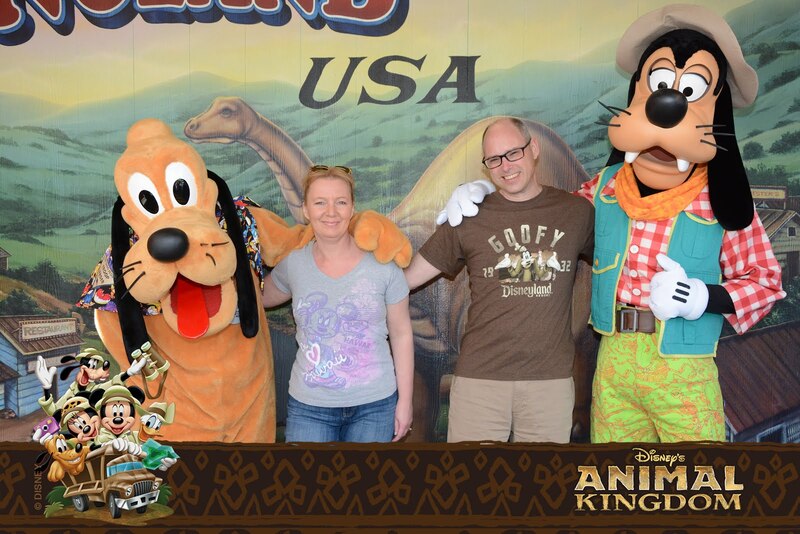 Looking at Goofy's bright eyes never, ever, ever gets old. Mr. Goofin' Off and I haven't had a chance to carve pumpkins yet. I was thinking about this the other day and looking up some fun designs on Pinterest. There are so many cool designs. But I found some really fantastic Disney designs with carving templates right on Disney's family.disney.com website. 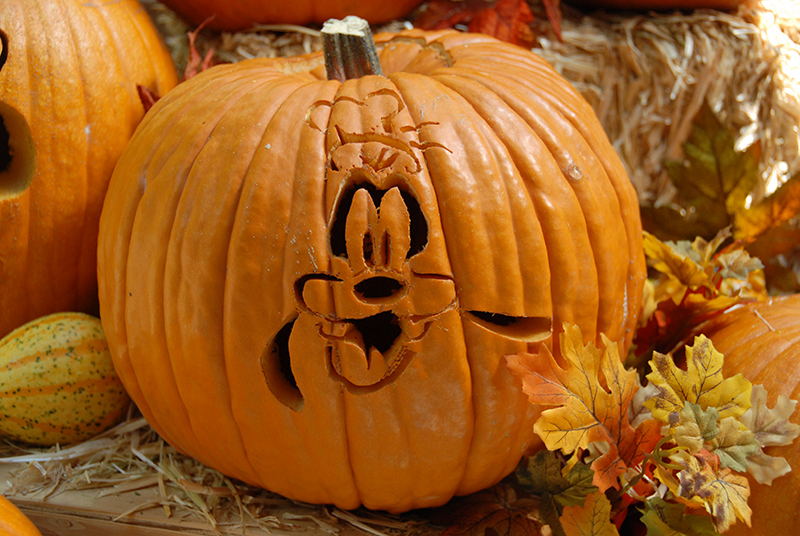 Check out this Goofy pumpkin! Hope I can talk Mr. Goofin' off into carving this one. It reminds me of the pumpkins we saw at Disneyland a few weeks ago. Oh, how I miss my Disney right now. So let me share a few more pictures of the Disneyland pumpkins. Thanks again for letting me indulge myself with my Disney goofiness. Are you carving pumpkins this year? If so, what will your pumpkin look like? I'd love to know in the comments. I'd enjoy some pumpkin-carving inspiration. I am a transcriptionist by profession. I am a Disney devotee, quilting nut, stitching fanatic, and volunteer hound by passion.